Number of repeating EventType entries.. Entry of EventsEntry repeating group. Definition at line 2236 of file Messages.h. Definition at line 2248 of file Messages.h. Definition at line 2251 of file Messages.h. Initializes instance of given version over given memory block. Definition at line 2257 of file Messages.h. Returns size of entry body in bytes for given version of message template. Definition at line 2290 of file Messages.h. Definition at line 2297 of file Messages.h. Time of event. This is number of days since unix epoch. Definition at line 2278 of file Messages.h. 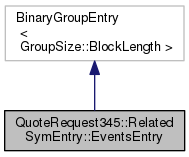 Code to represent the type of event.. Definition at line 2268 of file Messages.h.